And now for something completely decadent. I first made this a couple of weekends ago when I had some girlfriends round for dinner. Well, actually I had them round to cook dinner. A sort of half dinner party half cooking class with a liberal dose of vino thrown in to the mix. It was really to show how easy it is to bring out your inner domestic goddess and to throw together a quick dinner party, so the theme was easy entertaining. 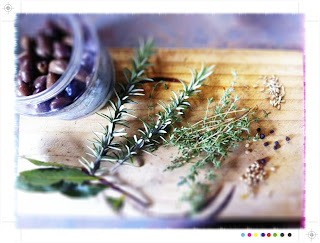 First up some marinated olives and mustard batons from the wonderful Around My French Table by Dorie Greenspan. Olives bursting with flavour from the infused olive oil and puff pastry batons with a mustard filling. All very easy and even better they can be made ahead. For the appetiser a seasonal winter salad with rocket, radicchio, roast vegetables, Maori potatoes and pear topped with a little homemade dukkah for a little crunch. 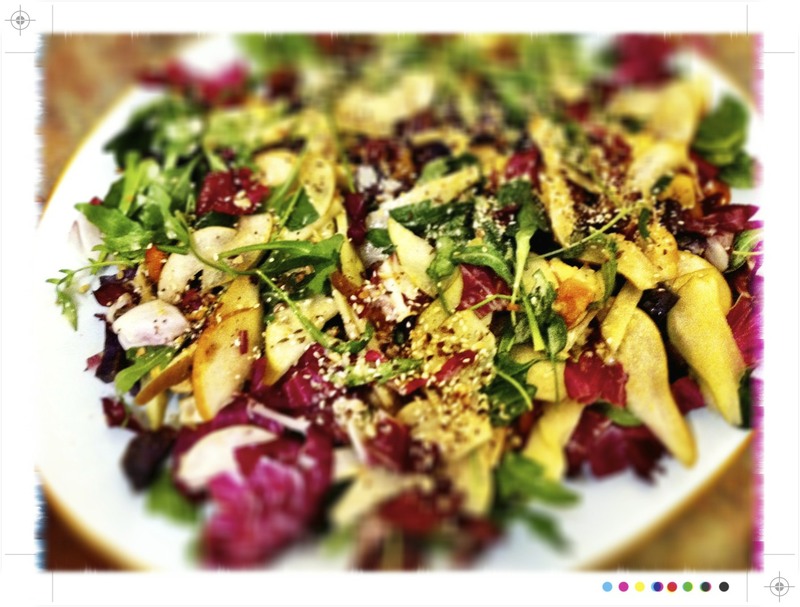 However it being a seasonal salad, really anything in season will work so you can toss together all sort of different combinations. For the main course chicken Milanese with a fennel and tomato sauce. With tomatoes not being in season a jar of cherry tomatoes courtesy of Sabato. These are a favourite pantry staple. Mixed with a few herbs and tossed through pasta you can have dinner in under 10 minutes. 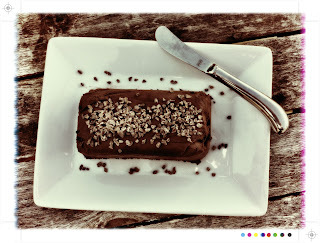 To finish a decadent chocolate dessert from 101 Cookbooks. A no bake chocolate cake or a very large truffle. Very easy to whip together as essentially melted chocolate mixed with cream and chilled until it becomes a little truffle type cake. The original recipe is delicious but it does lend itself to all sorts of variations. For dinner with the girls I added a little Cointreau and served it with a little whipped cream also with just a dash of Cointreau. The whipped cream added a little lightness to the delightfully rich and decadent chocolate. I foresee a lot of chocolate truffle cakes this Christmas. Perhaps cranberry and pistachio or hit with a little limoncello. For my first experiment I came up with a Baileys version. Baileys Chocolate Truffle Cake, inspired by Heidi Swanson at 101 Cookbooks. 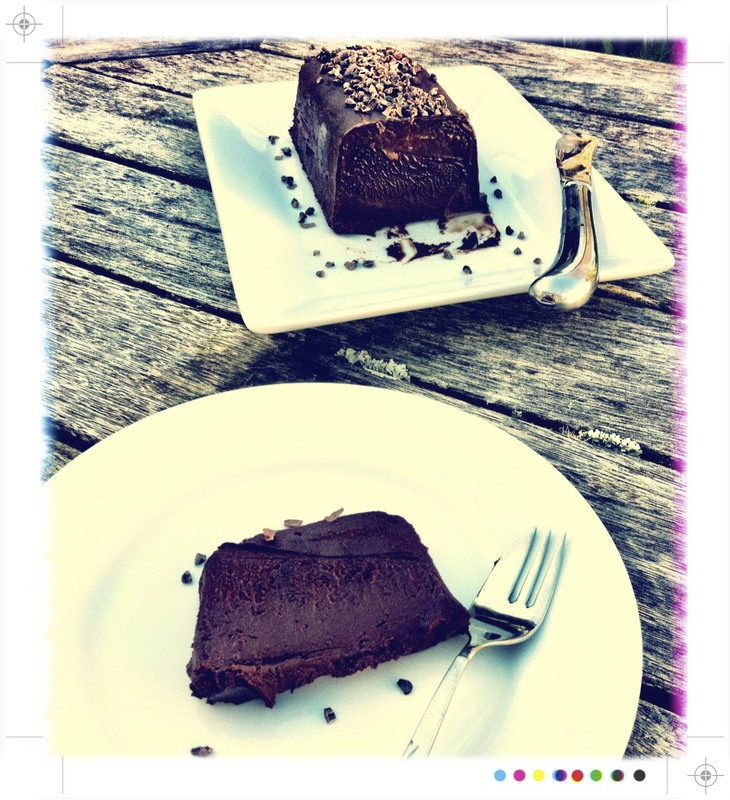 Serves 8-10 depending on how much people love an extremely decadent rich chocolate dessert. Lightly butter or spray a petite loaf tin or something of similar size. 101 cook books suggests a 6cm spring form pan or equivalent. I found my petite loaf tins for a few dollars at the local supermarket. 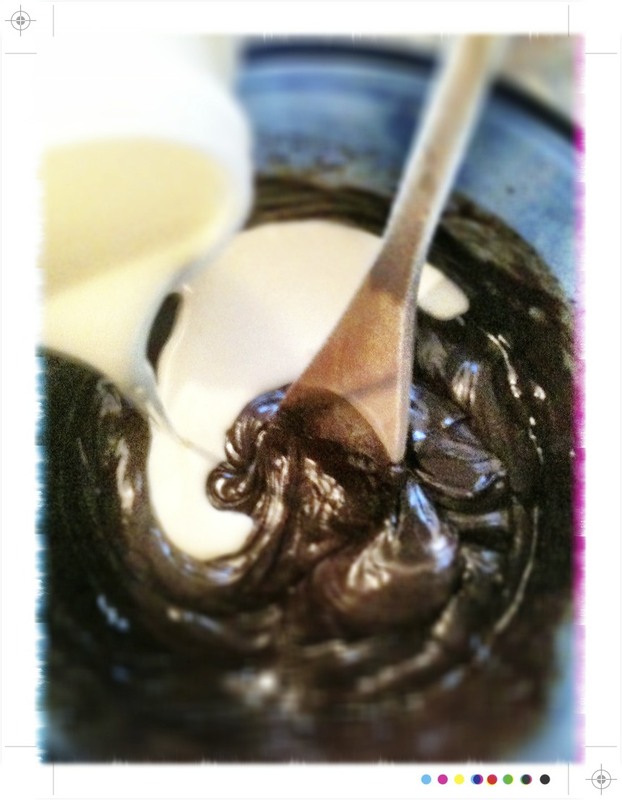 The recipe makes about 2 cups of mixture. It will look small but this is rich, really rich. Line the loaf tin with baking paper and set it aside. You can use a larger dish but if you do it will just mean thinner slices. Melt the chocolate over a double boiler, simply a saucepan with an inch or 2 of barely simmering water topped with a bowl. Be careful not to let any water get in to the chocolate. They are not friends! 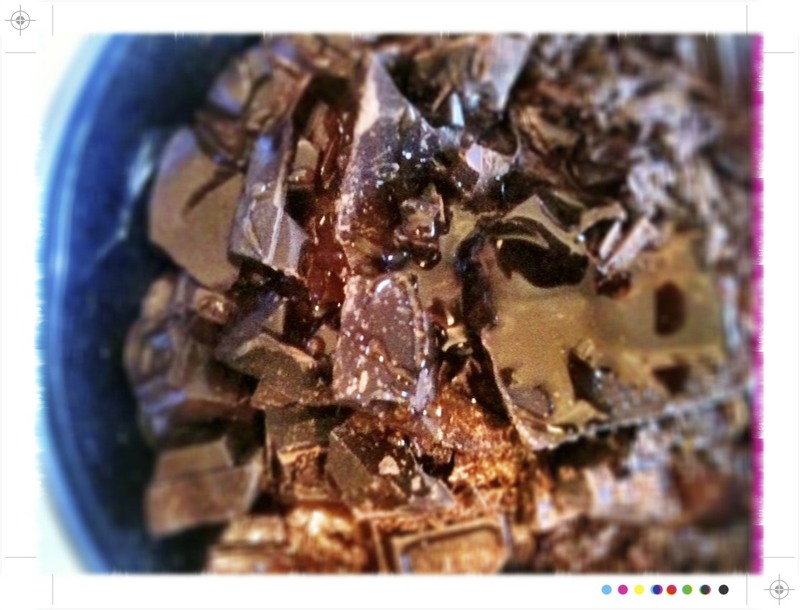 It will seize up and a whole block of chocolate will be wasted and it is never good to waste chocolate. 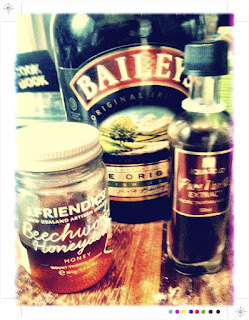 When it is almost melted add the Baileys, vanilla extract and honey. Gently stir and once all melted and mixed together remove from the heat. Slowly stir in the cream and add a little pinch of salt. Once everything is all mixed well together pour it in to the prepared loaf tin. Cover with cling film and place in the fridge, for a few hours or overnight, until it is chilled and set. To serve remove from the loaf tin and let it sit for a few moments. Dust with cocoa or the cocoa nibs, slice and serve on its own or with a little whipped cream or vanilla mascarpone. This was slightly less rich than the cointreau infused version. 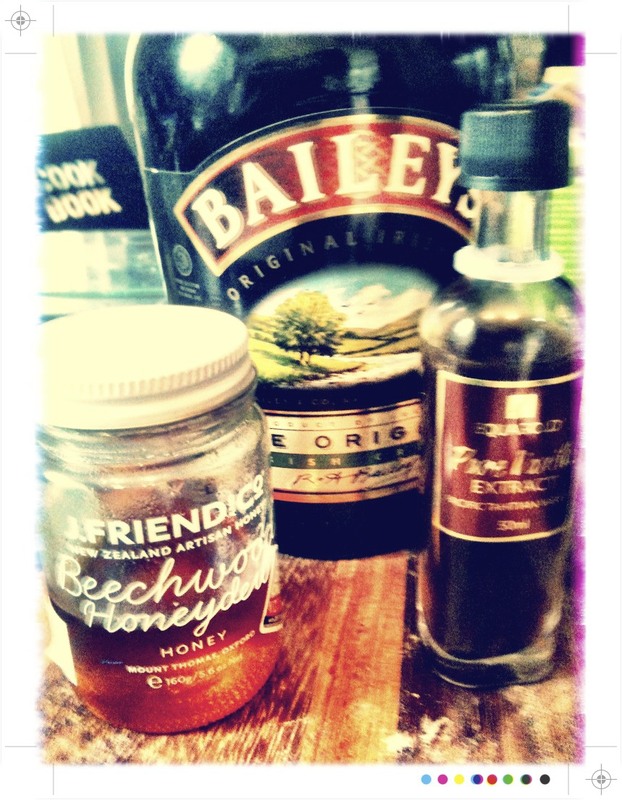 The Baileys and the honey mellowing it out a little. 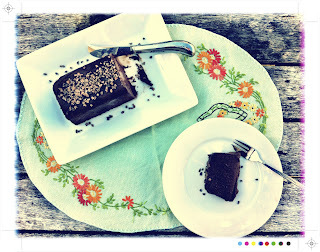 The cocoa nibs look pretty but also a nice crunch to the smooth truffle cake. This decadent delight is heading over to take part in the inaugural Sweet NZ being hosted by the lovely Alessandra over at Alessandra Zecchini. 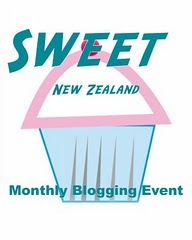 If you're in NZ, head over, check it out and join us in celebrating Sweet New Zealand. That cake deserves a +1! I didn't understand when yu put the Baileys in though, with the cream? Your dinner/cooking party sounds fabulous...and, of course, this dessert is fantastic! I'm intrigued by your suggestion of limoncello and will try it. AND it's no-bake! Perfect for me at the moment. But why am I thinking about extra Zumba classes at the same time as I'm thinking about eating this cake?? 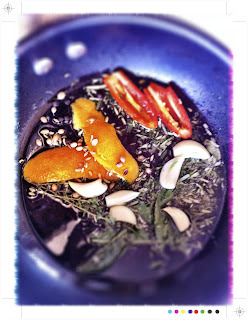 @Alessandra Thanks Alessandra, & well spotted...recipe amended! Great Entry for Sweet New Zealand Mairi!! Thank you and... you are the first! Sounds very moreish will look forward to sampling it. The whole party sounds fabulous and thanks for reminding me about Dorie's book (yeah, we're on a first name basis). I have everything for the cake except for cream. Perhaps will wait for an occasion to make it. Soon. Howdy! I just want to give a huge thumbs up for the nice information you will have here on this post. I will be coming again to your weblog for more soon.